Ahhh...we finally got to enjoy live baseball yesterday! Just think, nearly every day from now until the end of October, we will be able to turn on the television and watch a baseball game. Spring is near! Does Whit Merrifield Have What It Takes To Repeat? Whit Merrifield came out of nowhere last season to be one of the biggest profit centers in all of fantasy baseball. A year after hitting 2 homeruns and stealing 8 bases in 91 games as a rookie, Merrifield smashed 19 homeruns and stole 34 bases in his second full season. But the key question that should be asked is if the indicator statistics support the breakout. The answer to that question is....it depends. Does a 31% hard hit rate support a 9.6% HR/FB rate? Absolutely. Does it support 19 homeruns in a very pitcher friendly ballpark? Maybe not. But before you jump off the Merrifield bandwagon, it's important to realize that his two most valuable categories are actually stolen bases and batting average, two stats that he's very good in and two stats that are extremely scarce. In terms of repeatability, as Anthony Perri notes here, stolen bases have the highest predictive value of any statistic we measure in a normal 5x5 league with a 0.75 correlation in performance versus forecast. Batting average, on the other hand, checks in with a 0.42 correlation, the lowest among the offensive statistics. So what does that mean for you, in the draft room? 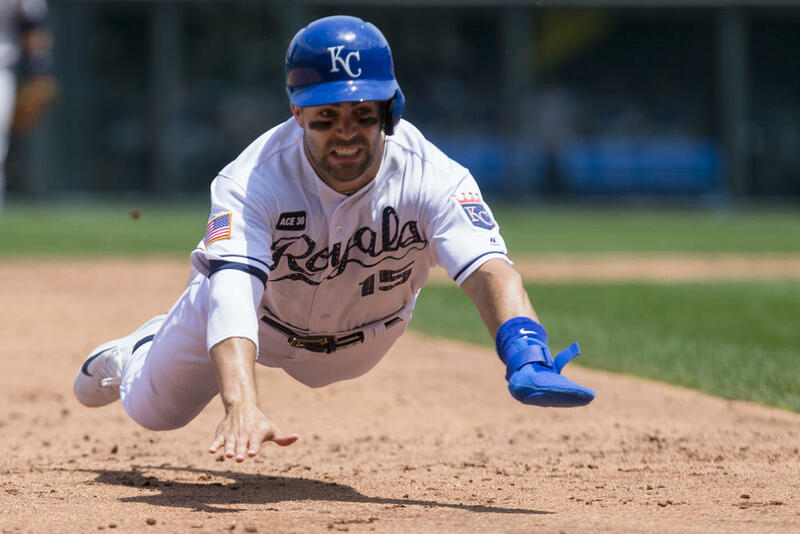 It means that now that Whit Merrifield has displayed the ability to steal 34 bases, it's probable he can do it again under similar circumstances. The homeruns, on the other hand, seem a bit overstated given his average 30% hard hit rate and low 33% pull rate. In terms of batting average, as long as you realize the variance risk, Merrifield's .288 mark from 2017 certainly seems reasonable given his .308 BABIP, a number that's supported by his speed skill set. He also showed signs of better overall handle of the strike zone by improving his strikeout rate from 22% down to just 14% in last season. Merrifield seems like a very strong option in the middle infield this year, although much of his helium seems to already be baked into his current ADP. Look for him to be a solid bet to repeat his breakout performance this season. Can Nate Karns Become Fantasy Relevant Again? Nate Karns showed much promise in 2015 after posting 147 innings with the Rays while putting up a 3.67 ERA and a solid 23% strikeout rate and 9% walk rate. However, two injury filled seasons followed him in Seattle and Kansas City last year. This spring, however, he has declared himself healthy and ready to compete for a spot in the rotation. There's not a lot of competition standing in his way, at least until the Super 2 deadline passes, and as long as he proves his health in the spring, he's potentially a sleeper in deep mixed leagues. Whose Batting Lead-Off For The Cubs? The Cubs off-season additions didn't include a prototypical leadoff hitter. In fact, losing Jon Jay to free agency only exacerbated the problem. Speaking to the media on Friday, Maddon suggested he would give looks to at least four players at leadoff during spring training. Those players include Albert Almora, Ian Happ, Ben Zobrist, and maybe even Anthony Rizzo. Rizzo did lead off 14 times last season, but it was Ian Happ who drew the first spot in Maddon's first lineup card of the pre-season. Given the way to club is built, it's likely that Maddon won't stick with just one player during the regular season. In fact, it's likely that Almora, Happ and Zobrist will all rotate playing time this year anyway, making it necessary for multiple players to feel comfortable leading off. That's good news for those of you who play DFS because that means that on any given day, a new player will have a higher value than his built is price might suggestion. No, no one will ever be able to replace David Ross in the clubhouse, but it sounds like the Cubs managed to establish yet another pitcher/catch relationship that's nearly as special as the one Jon Lester and David Ross shared. Weeks after the Cubs signed Yu Darvish's unofficial personal catcher, Chris Gimenez, Darvish finally inked with the team. The signing also meant that rookie Victor Caratini would likely be ticketed for Triple-A to begin the season. Now, why are you asking yourself why we're talking about a backup catcher and the implications in fantasy leagues? The reason is because we're right in the middle of the busiest time of the year for NFBC Draft Champions drafts, the format where 15 teams draft 50 players each. When you figure that every team starts 2 catchers and each team usually ends the draft with at least 1-2 catchers on the bench, you soon realize plenty of backup catchers are being drafted. In fact, based on ADP, Victor Caratini is currently being drafted about 150 spots ahead of Gimenez and Caratini is currently the 42nd off the board, easily a team's first backup catcher. So word to the wise, break from ADP and take Darvish's personal catcher who'll at least be guaranteed 32 starts over the course of the season rather than some other team's backup option, who may see less regular playing time. Eric Hosmer signing with the Padres will push Wil Myers to the outfield, leaving just two outfield spots for Manny Margot, Hunter Renfroe, Jose Pirela, and rookie Franchy Cordero. Pirela, who was originally an infielder when he was acquired from the Yankees in 2016, has begun taking reps at second base during spring workouts. Getting Pirela's bat into the lineup should be a priority for the Padres because outside of Manny Margot, this team lacks a speed element from most of the other position players. Pirela is in no way a speed demon, but he did steal 30 bases in single-A and managed to swipe 12 bags across two levels and 120 games last season. Alternatively, showing opposing teams that Pirela has the flexibility to play both in the infield and in the outfield, it makes him a much more attractive trade chip should teams call upon the Padres. Speculation has been rampant since the signing of Eric Hosmer that the team would entertain offers from one of their now expendable outfielders. Unfortunately, the free agent market is already saturated with players with similar skillsets to Hunter Renfroe and Wil Myers, so San Diego may actually return more relative value in a deal with Pirela than the other two, higher pedigree type of players. One of the recent movements that has caused a lot of frutstrations for fantasy owners is the change in bullpen deployment by managers. The days of a single reliever coming into the ninth inning with a lead may be coming to an end. The reason is because managers are realizing that frequently the most important inning to escape isn't the 9th, but sometimes the 8th or sometimes the 7th. By bringing in your best reliever in the highest leverage situation, you're maximizing his value. We're already seen many playoff teams find tremendous success with this strategy (think Andrew Miller and the Indians, Wade Davis and the Cubs, Chris Devenski/Ken Giles and the Astros). Based on comments from Padres manager Andy Green, Brad Hand is likely going to be used in the same in 2018. "We'll find interesting ways to utilize him that maximize our abilities to win games," Green said. "He'll close some games, for sure. But how that all plays out, I don't have that mapped out right now." More often than not, Hand will be the one closing out games, but he will most likely share the duties with Kirby Yates or Kaz Makita when he's not in the 9th inning. Jonathan Schoop (BAL) - Jonathan Schoop was scratched from Friday's lineup with elbow bursitis. According to him, he bumped it earlier this week, which led to the swelling he experienced yesterday. It's on his non-throwing arm and the injury itself is relatively minor, so it shouldn't impact his availability for much of the spring. Schoop is entering the 2018 season as one of the top-end second base options after realizing the potential many of his indicators suggested he could do a year ago. While he lacks the speed you typically like to see from a middle infielder, he makes up for it with elite power and solid batting average potential. Schoop's 36% hard hit rate is more than enough to support his 17% HR/FB rate. Yasiel Puig (LAD) - Yasiel Puig missed Friday's spring training game because he injured his hip while trying to break in new cleats, according to Ken Gurnick of MLB.com. Yes, you read that correctly, Yasiel Puig is blaming his sore hip on playing with a new pair of shoes. On one hand, you can write this off as just another wacky spring story that probably wouldn't be news in season. On the other hand, it's just another reminder that Yasiel Puig loves the spotlight and being the center of attention, so you have to take the good with the bad when you draft him. Puig finally put it all together in 2017 and managed to stay on the field for 158 games, rewarding this owners with 28 homeruns, 74 RBI, 11 stolen bases and a slash line of .263/.346/.487. Now 27 years old, Puig needs to repeat that season to regain the trust of most fantasy players, but it's noteworthy that this is the final year of the 7 year pact he signed back in 2012. Dustin Fowler (OAK) - One of the trendiest players of the spring, Dustin Fowler visited his doctor in Chicago on Friday to receive clearance for spring training games. Fowler tore his patellar tendon while playing for the Yankees last season and has endured through a lengthy recovery. Now with Oakland, the speedy outfielder has an outside shot at winning the centerfield job during spring training. Fowler hit 13 homeruns and stole 13 bases in 70 games for Triple-A Scranton last season and hit 12 homeruns and stole 25 bags the year before. Don't expect the power to translate to the big leagues immediately, especially since he'll be playing his home games in the Coliseum, but he's certainly a potential source of speed in the latter half of drafts if he can prove his health. Daniel Hudson (TB) - Tampa Bay acquired reliever Daniel Hudson along with a minor league infielder in return for DFA's Corey Dickerson. It turned out to be a decent return for the Rays, who landed a reliever who was once thought of as a future closer. His performance derailed for portions of last season, but he still has an intriguing combination of strikeout ability and groundball inducing "stuff" to at least be included in the mix, should the Rays decide to trade Alex Colome this year. Corey Dickerson (PIT) - The trade of Corey Dickerson puts a damper on some of the excitement to Austin Meadows, the assumed beneficary when the team traded away Andrew McCutchen this off-season, but it also opens the door for more value for Dickerson. The left-handed is expected to be the Pirates everyday left fielder and will likely find a home in the middle of the Pirates batting order. While the Pirates actually needed a right handed power bat, Dickerson doesn't have severe splits against either handed pitching. Dickerson should be viewed as an OF5 for fantasy purposes. Brent Honeywell (TB) - The Tampa Bay Rays officially announced that starting pitcher Brent Honeywell does have a torn UCL and will miss the upcoming 2018. It's unfortunate timing for the rookie, whose outlook was brightened with the recent trade of Jake Odorizzi. Now his availability for the beginning of 2019 is also in doubt. The news does create an interesting opportunity for former Dodgers top pitching prospect, Jose De Leon, who could serve as the team's 5th starter as early as mid-May. Carlos Rodon (CWS) - After missing the first half of 2017 with a shoulder ailment, Carlos Rodon underwent arthroscopic surgery in the off-season. Unfortunately, it was announced that he would not be ready to return until the middle of the season. At this point, it's difficult to even consider him part of your mixed league draft plans, so he's best to leave in the draft pool and draft day. Francisco Liriano (DET) - Francisco Liriano and the Detroit Tigers reportedly reached an accord on Friday, agreeing to an incentive-laden contract. Liriano become a reliever when he joined the Astros, but it sounds like he's going to have a chance to compete for a rotation spot with the Tigers. His primary competition will be Daniel Norris, but also potential Matt Boyd, if he hasn't already locked up the SP4. Liriano is no longer the electric strikeout pitcher he once was, but he still has the same command problems. Even if he wins the job, his outlook at a productive fantasy asset is murky. Ryan Braun (MIL) - Ryan Braun has been seeing reps at first base during the initial drills at spring training and reports have been positive. The Brewers outfield is awfully crowded after the acquisitions of Christian Yelich and Lorenzo Cain, but a move to first would allow Domingo Santana to get a little more playing time. Of course, that time would come at the expense of Eric Thames, who would in turn take a seat in lieu of Braun. It's very possible Braun, Thames and Santana end up in a playing time rotation similar to the division rival Cubs handle Ian Happ, Javier Baez and Ben Zobrist. Eduardo Rodriguez (BOS) - E-Rod underwent knee surgery at the end of last season, but he's currently scheduled to make his first bullpen session on Monday. Even if all goes smoothly, he still has a way to go in his rehab and will be significantly behind the other pitchers. Nonetheless, it's a positive step in the right direction and seems likely he will be available to the Red Sox at some point this season. Fantistics is projecting Rodriguez for about a half season, but taking a step forward with a 3.89 ERA, 1.25 WHIP and 88 strikeouts. He's still just 24 years old.